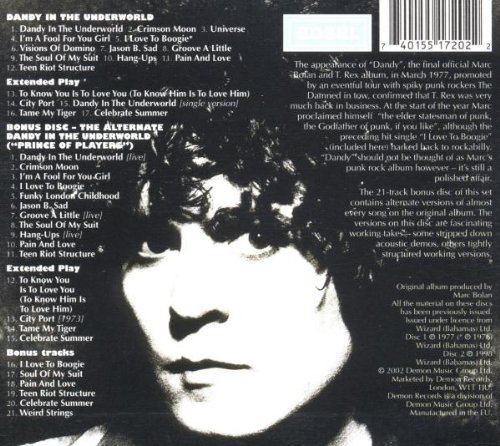 As we come to the final album of T.Rex's initially glorious, latterly less-so career, it is extremely easy to categorise most of the albums - "Electric Warrior" and "The Slider" as being great (which they are); and "Tanx", "Zinc Alloy", "Bolan's Zip Gun", "Futuristic Dragon" as being "patchy" or being an "embarrassing fall from grace". This one, is often described as being Bolan's "great swansong". In reviewing his work, I have found good points and bad points, especially in those latter four albums. The same is true with this one. In my opinion, it is not a "return to form" or whatever other reviewer's cliche it may be tempting to use. It shares many characteristics with the other "post chart success/glam rock royalty" albums. It is good in parts. Patchy and awkward in others. The big hit single, and a track that has proved enduring is obviously the standout (because everyone knows it) - the impossibly catchy "I Love To Boogie". The album's other single, "Soul Of My Suit" is one of those "Bolan dabbles ever so slightly in soul" numbers, but it has an appeal. The non-album single, "Celebrate Summer" (the band's last single) was a corker. Shame it made no impact on the charts. The title track is, along with "Jupiter Liar" from the previous album, one of the great forgotten Bolan classics. One feels had both of these been released in late 1973/early1974, for example, they would have been huge hits. Imagine replacing "Truck On Tyke" and "Light Of Love" with these two. Bolan's star might not have faded so soon? On the whole, the album is rockier and possibly more "glam" than the previous two, harking back more in feel to "Tanx" and "Zinc Alloy". The sound is still a little bit trebly, but this remastering has brought a bit more of the bass to the party, thankfully. The screeching female backing vocals that so marred "Bolan's Zip Gun" in particular have been toned down a little bit. Unfortunately, synthesisers replace guitar too often on many tracks. Imagine the material on here recorded in an "Electric Warrior" or "Slider" style? "Crimson Moon" is a delightful throwback to earlier days, with one of those "Telegram Sam"-style riffs. Another one that could have been a big hit had it been recorded and released a few years earlier. It borrows a guitar lick from Paul McCartney's "Junior's Farm" though, I am sure. "Universe" is one of those soul/funk influenced slower numbers, with swirling organ parts and a funky guitar. The following track, "I'm A Fool For You Girl" is a similar mix of soul and rock music and vocals, more than a little appealing. It is as if what he trying to achieve on "Bolan's Zip Gun" had been reached with these two. "Visions Of Domino" has a very 70s uniform rock riff, but I can't place it (Mungo Jerry's "Alright Alright Alright" maybe?). "Jason B. Sad" unfortunately rips off "Telegram Sam" in both its riff and verses. It sounds vaguely odd when Bolan exhorts "Jason!" in the song, a bit like shouting out "Andrew!" or "Philip!". "Groove A Little" starts off and continues with a "Can I Get A Witness" keyboard part. It has a funky ambience to it though and Bolan's voice sounds as good as it had for a while. He is struggling for originality, composition-wise, however. 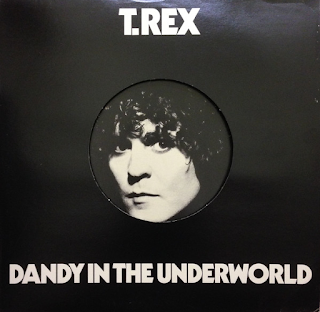 "Hang-Ups" is another funky one wth some great Bolan guitar at the end. All the supposed funk experiments that were apparently on "Bolan's Zip Gun" seem to have ended up here, actually, to great effect. It makes this the better, more fulfilled album. "Pain And Love" sees Bolan's voice is really different on this one and "Teen Riot Structure" is an upbeat, nostalgic closer. In the extras, Gloria Jones singing “To Know Him Is To Love Him” is terribly sad, unsurprisingly. “City Port” is an excellent little gem. Overall, this is not really a bad album at all, it was just in punk-dominated 1977 it was just a little out of time. Had Marc Bolan lived, I wonder what would have become of him? I'm not sure that creatively he had much left in him. He would probably have continued playing his legacy for many, many years, and why not? It was one hell of a legacy.